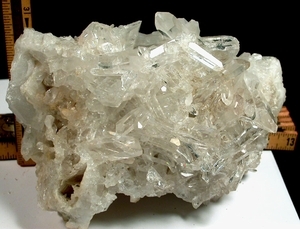 Super bright, super clear Arkansas crystals to 3/4x 2" shine in all directions from a 4-1/4x 6-1/2" milk quartz peek-a-boo base. We've assigned a most affordable price to this cluster considering its' brilliance and rainbows as there is extraction damage which yet does not detract from its' amazing energy. We suggest a prominent place on your healing altar or in your collector cabinet. From the closed  Clear Creek Mine.